Time: 4 hrs. 45 mins. Mee Arches are a group of natural arches that are located along the rims of Mee Canyon in the McInnis Canyons National Conservation Area and the Black Ridge Canyons Wilderness Area near Grand Junction, Colorado. While fewer in number than the ever more popular group of arches in Rattlesnake Canyon they are well worth the time and effort to visit. Route finding can be difficult in places where no well established trails currently exist. 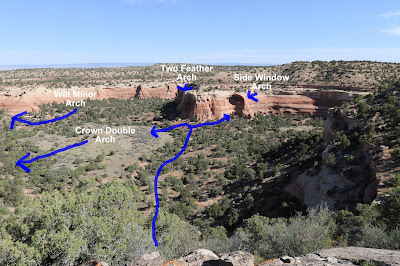 Access to Mee Arches is similar to that for Mee Canyon and Rattlesnake Arches via the Black Ridge Road. The upper road is open from April 15-August 15 while the lower road is open from August 15-February 15. Both routes are closed between February 15-April 15. The unmarked trailhead is a pullout on the left side of the road about 1.6 miles before the Rattlesnake Arches trailhead or 8.5 miles from the beginning of the Black Ridge Road via the upper route. For the first 3 and a half miles or so the route follows an old jeep road that works its way down the mesa between Mee Canyon and Rattlesnake Canyon toward the Colorado River. The road loses about 400 feet of elevation from the trailhead to where the route to the arches leaves the road. A glance at the trails elevation profile shows that most of the elevation loss comes at 2 steep descents where it loses 200 feet at each one. Most of the final 400 feet of elevation loss comes where the route drops down to the bench where the arches are found. Right around the 3.4 mile point the route to the arches leaves the old jeep road. We carried enough rocks to make a couple of small cairns to mark the spot. We had been here before and knew that there were no markers at the turn off. 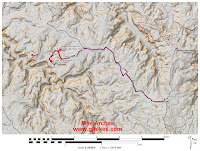 There is a technique that we use that combines the power of Google Maps, calpro.com and Map Builder to create GPX files and topo maps to use when we are exploring unfamiliar territory. That enabled us on our previous trip to find the turnoff and the drop in point that leads down to the bench where the arches are at. After leaving the road there is an ever so faint trail that a keen eye can catch glimpses of that leads toward the drop in point to Mee Canyon's upper bench. The trail starts out crossing a sagebrush flats until it gets within a quarter mile or so of the canyon's rim. At that point the trail enters the trees and splits into multiple confusing routes. A GPS is indispensable for finding the most direct course to follow. The drop in point is at 39.13308, -108.8924. There is a small cairn marking the spot as well as another cairn or two along the rim of the canyon. 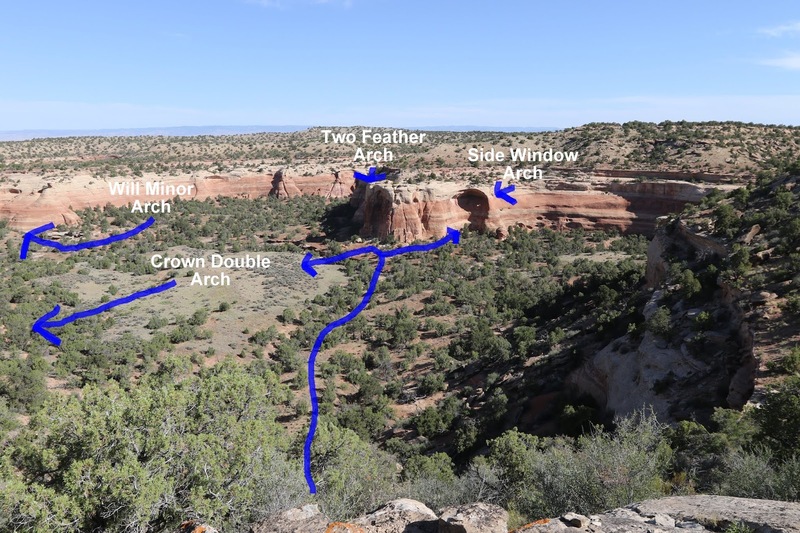 From the edge of the canyon you can look across and see the Two Feathers and Side Window arches. There aren't any established trails to follow but the jist of it is to work your way down the steep slope into the canyon where you can follow a wash over to the 2 arches that are visible from the rim. From there you can cut back across the canyon and around the point to get to Crown Double Arch. For this post we didn't visit Will Minor Arch. It is about a mile away around the bench in the direction of the Colorado River. Since we didn't make it that far we are just guessing at the distance by drawing a line on the map and then measuring it. We added a few cairns around the middle of the descent to mark the route that we followed which turned out to be pretty good. A close look at what they are calling Two Feathers Arch shows that it has more than one opening. Side Window Arch is in the wall of a nearby alcove. There are a few cracks in the rock around it that indicate the arch's opening will be expanding at some future time. According to our maps Will Minor Arch is on the other side of the point of the cliffs in this photo. Will Minor Arch just happens to be the only arch that shows up on any of the maps that we have that we didn't make ourselves. At present there isn't any sort of trail at all to follow that heads in the direction of Will Minor Arch and without a trail it could take another hour or more to get there and back. There isn't a trail that leads around the bench to Double Crown Arch either. We headed down the wash until we found a reasonable looking place to scramble up to the base of the cliffs where we found a few faint tracks to follow. On the hike back we found some fresh bighorn tracks that followed a game trail that made a much better route. In our opinion the regal appearance of Double Crown Arch made the whole trip worthwhile and everything else was a welcomed bonus. Looking up the west side of Mee Canyon along the opposite bench you should be able to pick out Bulwark Arch in a fin that juts out from the cliff. The sun can be seen shining through the opening in this photo. On the trip back there is an option to hike over to Finger Arch that is along the west rim of Rattlesnake Canyon. 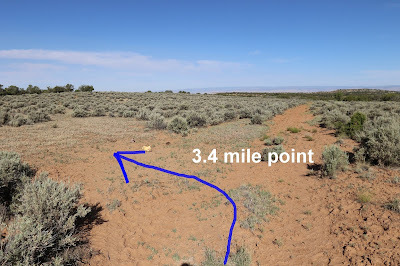 The best route is to follow a faint trail that heads in that direction just before passing back through the fence near the 3/4 mile point from the trailhead. You have to scramble down to a lower bench where you can follow the rim around to the arch that is located in the vicinity of 39.12858, -108.84409. We hope to make a return trip for it in the near future. It takes a bit of hiking to get over to the arches in Mee Canyon. Perhaps if a few more experienced hikers make the trip the trails will become better established and easier for others to follow. 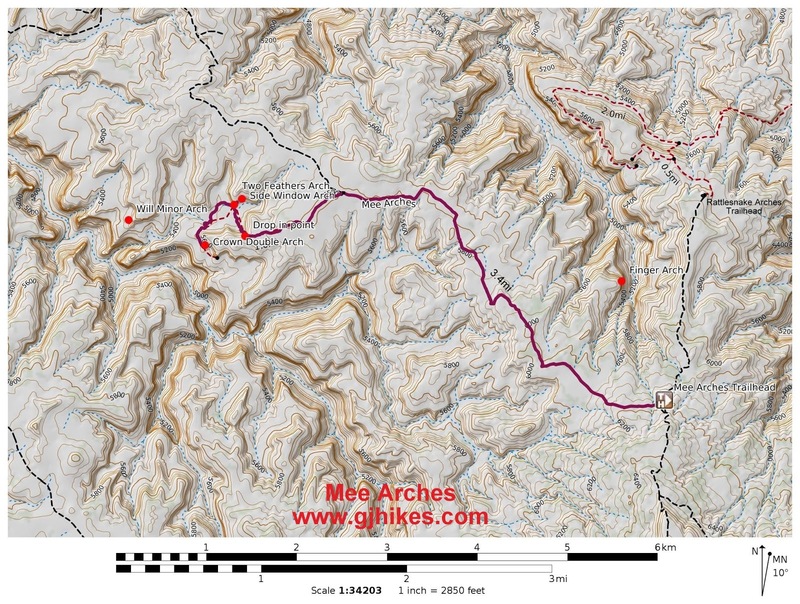 If you would like to see the arches for yourself then all you have to do is 'Take a hike'.